Tuesday, 11.18.2014. Learning by doing. Bag of cranberries in back of freezer from last year. Use them for color? Why not. I did find a web page that gave me some basic instruction. This is one of those "fun for the holidays" projects you can do with kids, age 4-8. Saturday. 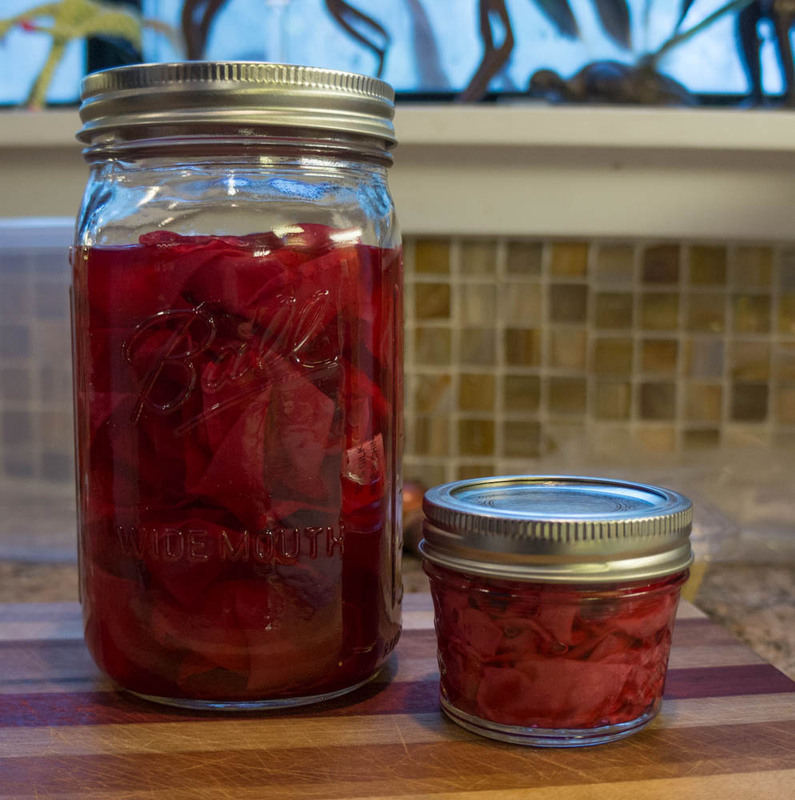 I cooked the cranberries in water for a couple hours and netted about a quart of "dye." 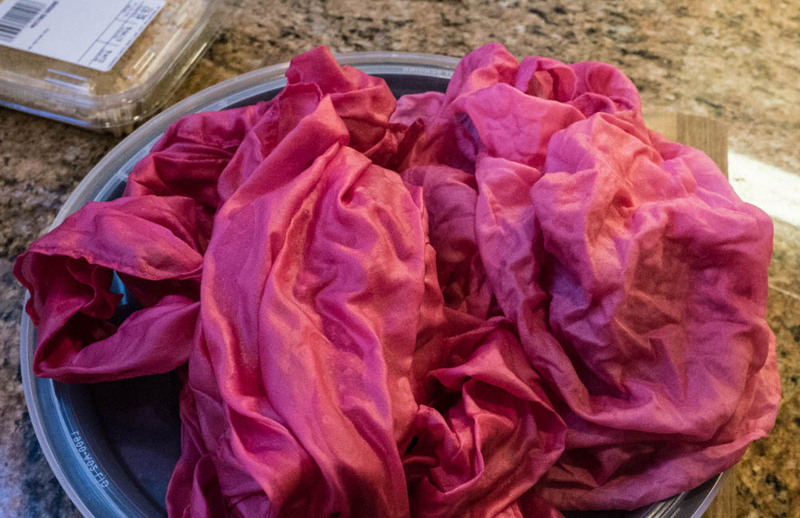 Meanwhile, I soaked a white silk scarf in 50/50 vinegar and water to brighten the color and help make it more permanent. When I was ready, I strained the cranberries out through an old linen handkerchief and poured the juice over my "pre-mordanted" silk. Then, what the heck, I mixed a little alum and cream of tartar with the rest of the juice and poured it over the linen handkerchief. (Smaller jar in photo below.) I read that vinegar brings out reds and alum brings out blues. If you drop cranberry sauce on a linen napkin, you wash it quickly before the stain can "set." With dyeing, you do the opposite. I let my cloth marinate in the juice for three days. Tuesday. Today I released the fabric from their jars and squeezed the liquid out (no rinsing yet!). Photo at top... still wet. 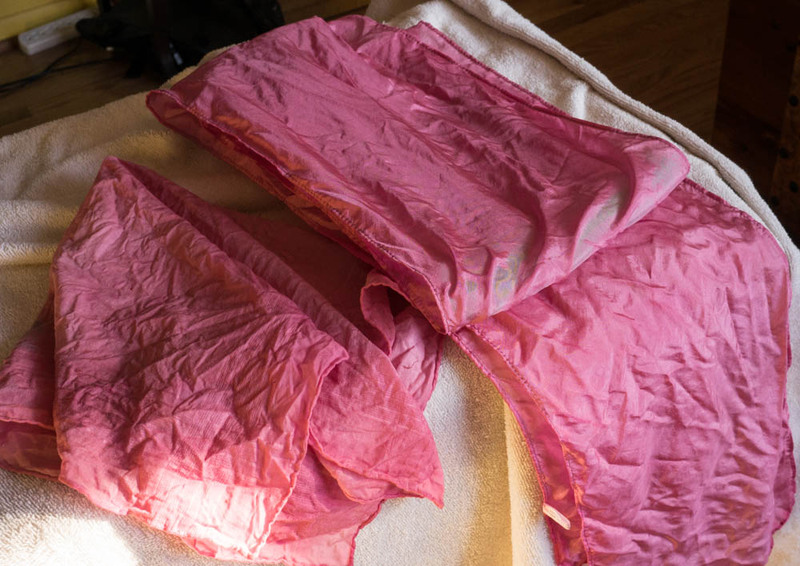 I will wait another few days before I rinse the cloth and iron it -- the color may fade a bit more when I do that. Meanwhile, I learned a lesson by mistake. I hung the cloth over my shower bar to dry. When I took them down to take a photo, I discovered that the chrome bar had changed the color where it touched the fabric -- you can see it on the edge of the fold on the scarf above/right. It might be greenish, but it looks gray next to the pink. Rats. I have only read about "auxiliaries" (aka post-mordants) but here was an example of introducing a reactive metal (aluminum? iron? tin?) to a dyed piece to modify the color. Like all my other mistakes, the evidence becomes part of the "cloth as journal."